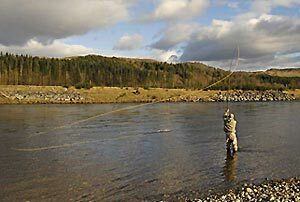 “Spey Casting Made Easy” is an all-inclusive package that aims to teach efficient salmon fly casting and fly fishing (including a fly tying evening) and is suitable for beginners or more experienced anglers. They will learn how to cast easily and efficiently and how to assess conditions to employ the most likely tactics for success with salmon fishing. The two day of salmon fly fishing school will commence on the evening of March 9, at The Kenmore Hotel and continues through Saturday and Sunday. Overview of the school objectives and curriculum. This is a rare opportunity to share experience and knowledge with Ally. The number of participating attendees is limited to six persons. Bookings will be accepted on a "first come" basis. The course fee of £530 includes two nights stay at the hotel with breakfast and a three course dinner in the evenings, lunches and tea/coffee during breaks. An additional night's B&B at the hotel costs £49.50. There is a supplement of £15 per night for single occupancy. Non-fishing partners rate is £63 per night for dinner, bed and breakfast (excludes packed lunch). A deposit of £100 per person is required to secure a booking for the course. (Deposits are non-refundable unless the place is subsequently filled.) The full amount of course fees (or balance as appropriate) must be paid by 28 days in advance of the school, otherwise the booking will be cancelled. Course Fees are non-refundable from 28 days in advance of the school on any bookings cancelled. Very enjoyable course. Friendly atmosphere made the course a pleasure to attend. Well set out objective and well delivered. Would highly recommend it. I thought the course was superb and great fun. I think and hope its given me the tools to go away and build on for years to come. A lovely occassion Ally; I am a bidder for a trout course. and because I so spastic I may come back to be re-trained on this one! A very interesting and enjoyable course. Great instructors. What you need to bring. The only real essentials that you will need are suitable eye protection (sunglasses or the like), outdoor and waterproof clothing. Rods, reels can be provided free for use during the course sessions. Guests are however encouraged to learn with their own equipment because that instills confidence in what you are using.